The way in which the #Thrive service in Rochdale was designed and is being delivered is aligned to the THRIVE framework (Wolpert et al., 2016). This case study was written based on a conversation between the i-THRIVE team and Karen Kenton, Associate Director of Integrated Commissioning for Children at Heywood, Middleton & Rochdale CCG/Rochdale Borough Council, Laura Beesley, Programme Manager for Joint Commissioning and Integration, Rachel McDonald, Children’s Commissioning Project Manager and Jason Smith, Operational Manager of #Thrive at Rochdale Borough Council and Healthy Young Minds Associate Directorate Manager, Pennine Care NHS Foundation Trust. The #Thrive service based in Rochdale is an early help, mental health service for children and young people (CYP) between 0-19 years. The service is jointly provided by Pennine Care NHS Foundation Trust, a local third sector service ‘Youth in Mind’ run by Mind, and leisure provider Link4Life. It was commissioned by Heywood, Middleton and Rochdale (HMR) CCG through an innovative collaborative commissioning process and won the Redesign of Care in Mental Health Award in the Healthcare Transformation Awards 2017. How was the service designed? A couple of years ago Karen and Laura secured funding to support them to fulfil their aim of establishing more collaborative commissioning and ensure the processes were led in collaboration by CYP. They worked with the Innovation Unit for 18 months to develop and test out an approach to collaborative commissioning and co-production in their development of an early help offer for the mental and emotional health and wellbeing pathway for children and young people in Rochdale. The process led them to develop the #Thrive service which was completely different to anything that they had commissioned before. They were originally thinking about extending their bereavement service and counselling offer but the insights distilled from the engagement work with children and young people showed that this wasn’t what was needed. #Thrive is much more about building social resilience and confidence, trust in adults and a peer support network, and having access to counselling and therapy when it was needed. It is a very holistic offer. This work has been further built upon with the use of social investment funds which means the CCG now offers grants to voluntary sector initiatives supporting children and young people which #Thrive can signpost to. Children and young people and parents were involved in the procurement process and evaluated the bids with Karen’s team and had their own interview panel. Feedback from children and parents showed that they had felt like they had truly been able to shape the service. In the final specification they could see the things they had brought up during engagement work. The children’s commissioning team were very determined to hold onto what children, young people and their families said they wanted and needed from the service. The commissioners wrote into the invitation to tender document that bidders should demonstrate an openness to working as a collaboration between multiple organisations and across sectors which is why #Thrive is a collaboration of an NHS mental health trust, a third sector and leisure provider. What were some of the challenges in taking this new approach to commissioning? Karen, Laura and Rachel all agree that it was a lot of hard work and challenging at times but they managed to build up momentum to complete the work in a relatively short period of time. A culture shift was required in the beginning to get people who were usually competitors in a room together and having honest conversations. People soon realised that this was the only way that they were going to be able to develop an innovative service which meets the needs of children and their families in a new way. Taking the story of a young person as a starting point means everyone in the room immediately connects with the issues at a human level. HMRCCG and Rochdale Council valued having the input of the Innovation Unit because they could provide an independent and challenging perspective and support the learning of the commissioning team. They learned to have faith in the collaborative commissioning process and to go into it with an open mind. The #Thrive service has been live since July 2016 but the café only opened at the end of March 2017 so it has only been the last six months that they have been able to develop the pathways into and through the service in the way that reflected the collaborative vision. 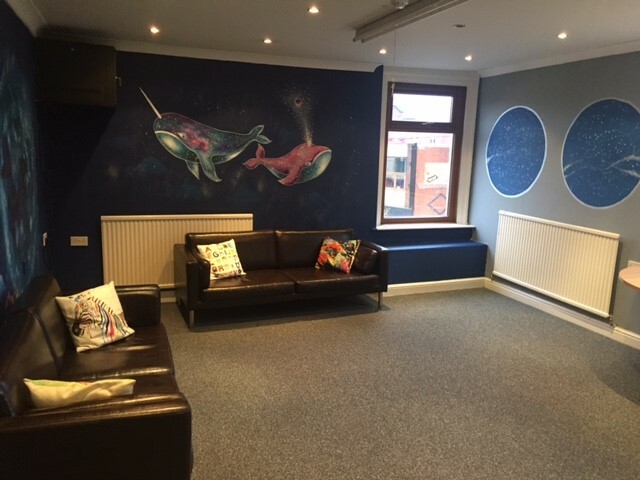 #Thrive is based in a community building named by young people ‘Around the corner’ with an on-site café. It is a bright and welcoming space. If you were to walk in you would feel like you were coming into a café first of all with a coffee bar. It then opens up into more bright spaces with lots of pictures on the walls and information about what’s going on in the borough. On the first floor there are rooms for 1:1 work and larger spaces for group work. 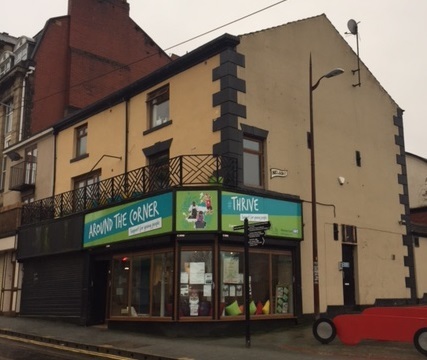 On the top floor are the joint offices for workers from the trust, Youth in Mind and Link4Life. 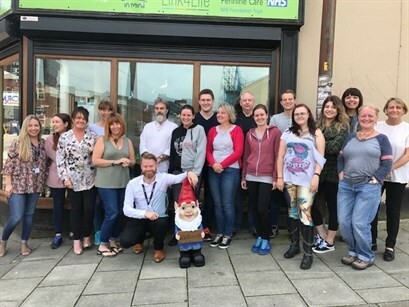 There is a team of 11 people who staff the #Thrive service who are a mixture of administrative staff, social workers, nurses, counsellors and qualified mental health support workers from voluntary sector partners. All staff have access to supervision from experienced mental health practitioners. A key innovative aspect of the #Thrive service is the Link4Life worker who is based there and whose role is to link the children and young people with leisure and creative activities that could benefit them. This is key to #Thrive being able to meet a broad range of needs because talking therapies are not the right option for everyone. For some young people the best thing for them is to be encouraged to do something active, new and sociable whether it’s football, boxing or making music. There is a wide range of activities provided by Link4Life which children and young people can tap into including third sector services. #Thrive is setting up a social prescription fund which to be managed by Link4Life. This money can be used to develop or pay for a bespoke service or intervention so that as many different needs as possible can be met. For example, a child with a diagnosis of autism may struggle to access mainstream social activities so the social prescription fund could be used to set up a group run by an existing voluntary sector service which runs a couple of hours one evening each week for anyone with an autism spectrum disorder. Jason is particularly keen to evaluate the outcome of this aspect of the #Thrive offer. A couple of the providers are aiming to do some of the activities side by side with the parents and CYP, creating time for them to do something together like learning to juggle in a circus skills workshop. It’s about building the relationships between children and parents and as we know from the evidence base of attachment that is key to promoting resilience. How do people access #Thrive? The service operates on the basis of ‘no wrong door’ and will support young people and families to access the support that is right for them. Children, young people, and families may simply drop-in to the service, which also receives formal written referrals. Referrals between CAMHS and #Thrive happen as a result of weekly pathway meetings that take place to discuss CYPs where the most appropriate service is not absolutely clear. There are three nights a week when the service is open until 8pm with the café staffed by mental health practitioners encouraging people to come in and talk without an appointment. Although the service will continue to accept referrals, it is currently trying to shift to a drop-in model, where GPs/schools etc. are encouraged to advise young people to drop-in to the service rather than make a formal referral. The service conducted a lot of promotional work for the #Thrive service in the first six months for example by attending away days for multiagency professionals. It is thought that most CYP and their families probably hear about the service through their educational setting. #Thrive is very centrally located so people may well just drop in to see what’s going on and learn about the service this way. Some further awareness raising of the service is planned. How are young people involved in the delivery of #Thrive? Children and young people were heavily involved in what they wanted the café to look like and in planning the launch day of #Thrive which involved community events across the town centre. The legacy of this work is a community art project running on site at #Thrive which continues to evolve the bright and welcoming spaces in the building. It seems that every time Jason goes in there’s a new addition to the design which has been led by a young person. There are young advisors working in the service who have previously used mental health services themselves and are building up the peer mentoring element of the #Thrive offer. They have developed a self-help booklet for children and young people who are thinking about making contact with #Thrive or are already using the service. The booklet will give advice and signpost to useful resources such as websites, books and online mindfulness courses. Their ultimate aim is to develop a mentor-based program of support for young people to tap into. What has been the impact of #Thrive? Rochdale is shifting away from activity-based commissioning towards outcomes-based commissioning and is working to find the right balance of how you do that without being onerous on the service. Karen said they might be a bit excessive at the moment in terms of the outcomes #Thrive is collecting. Routine Outcome Measures are used to track progress. They want to identify proxy indicators for outcomes that can be difficult to measure in order to be able to evidence the service’s impact and track more holistic outcomes. There is also the desire to look at longer term outcomes of the service such as reducing demand on CAMHS and improving efficiency. Service evaluation shows that the overwhelming majority of young people have a positive experience of #Thrive. The team are seeing an impact on unmet need with children and young people who would never have previously accessed services. The figures for the number of children and young people accessing an NHS service has increased because of the number of people being seen in #Thrive. The #thrive service has received 120-130 referrals a month since it opened its doors which was unexpectedly high. Anxiety, low mood and behavioural difficulties are the top presenting problems for children and young people accessing the service. Karen reflected on a meeting she attended a few years ago where a school worker talked about the pattern they had noticed when referring children to CAMHS where CAMHS would come back to say the child does not meet the threshold for specialist input. There was concern about the unmet need that existed in the void between what schools and CAMHS could offer. Now #Thrive has gone some way to fill this gap and it is working to link together different parts of the system so schools are feeling much more supported. What are the plans for further development? The team would like to do some more thinking about measuring the long-term impact of #Thrive. If it leads to fewer referrals to specialist CAMHS, they may need to consider resource allocation. How is #Thrive aligned to the THRIVE framework? #Thrive is aligned to the THRIVE framework in a number of ways. #Thrive puts the needs of children and young people at the centre of how the service is delivered. It has a role in ‘Thriving’ by promoting community resilience and developing capacity in the wider workforce. The service has a large role in ‘Getting Advice’ by supporting self-management and linking CYP and families to services and resources that will help them. 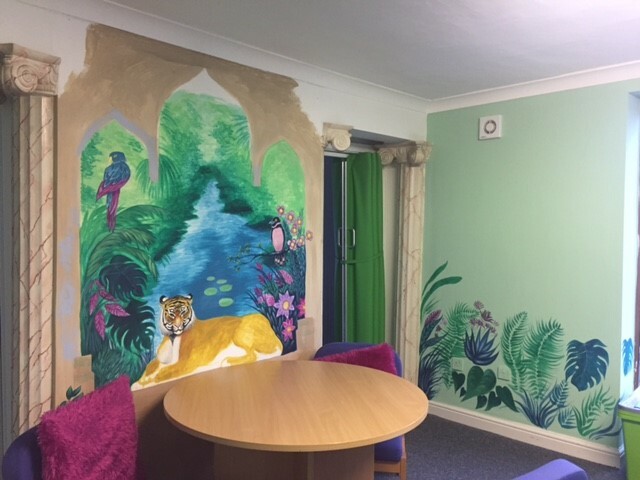 CYP and families have the option of attending one of the drop-in sessions which can sometimes prove to be enough input to stabilise and reassure a family. The THRIVE framework encourages greater flexibility in meeting the needs of CYP where they choose to receive it. Through the social prescribing and Link4Life worker, the #Thrive service has the ability to be very flexible with how they meet the needs of their CYP.